I live in the United States, and Ama lives in Canada. We often discussed the cultural differences between our two countries, and it became obvious to me that despite advantages like universal health care and support from the international community, Ama wasn't happy. She was involved in a failing real-life relationship, but she didn't know how to extricate herself from it. With some coaxing, I convinced her that she had to make a change to avoid her misery - she needed to stop dwelling on their history and start thinking about her future. At the time, I wasn't sure if I would be in it. Ama definitely wanted me to be part of her future, however, and over a year has passed since we made our feelings plain to one another. Though our relationship began in World of Warcraft, nowadays she comes across the border to spend time with me in the real world, not just a virtual one. She plans on attending college in the U.S., and I've considered moving to Canada. I've often heard that communication is the foundation of any successful relationship, and given the nature of MMOG communities, we're communicating almost constantly. We've had our difficulties, differences of opinion and even dramatic deviations from other areas of our personal lives. But I am confident that no matter what sort of storm blows around us, we can protect this little bit of happiness we've found together. Composed of gamers from all over the world, MMOGs are communities that truly transcend borders. 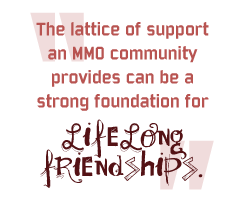 At their best, the lattice of support an MMO community provides can be a strong foundation for lifelong friendships. And even in less ideal cases, you at least have a guild of gamers good enough to topple whatever challenges the game developers dream up, indicating some modicum of intelligence and teamwork. If you're open to the experience, it can greatly enhance your life. It's impossible to say what sort of connection you're going to make when you log in to an online game. So the next time you enter a lobby for a shooter or stare at the loading screen of an MMOG, keep an open mind. You never know who you're about to meet, even if it's in the course of a profanity-filled deathmatch. Josh Loomis is a freelance contributor to The Escapist and an advocate of MMOG connections.